Last week, Vibram, the company that makes the five-fingered running shoes (well, the first version), settled a $3.75 million class action lawsuit, bought in 2012 by an unhappy customer. Her claim was that Vibram had used deceptive marketing messages, making claims about the benefit of the shoe that could not be supported by science. In the settlement, Vibram is obliged to pay each customer (the estimate is 70 million of them) a partial refund of $94 on their purchase, though it is being reported that the likely payout will be between $20 and $50. Also, Vibram will no longer be able to make those claims in future advertising, and have to promote the settlement extensively. b) individuals are so different that giving advice from the bubble that was the ‘movement’ was always, at best, only going to speak to a segment of the population. What of the rest? Sure enough, since the initial explosion, evidence has slowly emerged to urge caution against the widespread advice supporting barefoot running. Some evidence says the opposite, and barefoot running remains viable for many, but the balance has shifted, and surprise, surprise, we’re settling on something of a compromise and understanding of complexity in this particular debate (I hope others catch up soon). However, having said that, I feel for Vibram in this instance, for a few reasons. First, some of the claims are quite obvious – 1 and 5 for instance. There’s no doubt that the muscles will be strengthened. Whether this can happen independent of an injury risk is another story – you wouldn’t expect to head down to the gym to train yourself stronger without realizing that there is a limit to how much you can do safely. So perhaps fine-print trips that one up, or perhaps the burden for scientific proof is just so high that a logical outcome can’t be claimed. I would disagree with that. Similarly, number 5 is a definition, which is likely contentious but arbitrary, and ultimately, is there really anyone who would not say that being closer to ‘barefoot’ is more natural? It does not suggest this is better. The other three claims make promises of improvement, so I can see these being more problematic. However, I felt the whole lawsuit was harsh, and the settlement places the blame on Vibram, and does little to acknowledge that people, quite frankly, showed a real lack of common sense in their uptake of this new way to run. I wonder, for instance, how Vibram is different to say, that deodorant company that promises me that a quick spray before work will have a horde of beautiful women chasing me down the street? Or whether drinking that sports drink will really give me never-felt-before powers of endurance that would make Lance Armstrong blush? Perhaps, because Vibram are making borderline medical/clinical claims about their product, the standard is different? Perhaps the general advertising message is so ridiculous that people dismiss instantly the possibility that deodorant and sports drinks won’t turn me into Bradley Cooper or Chris Froome. Maybe Vibram were victims of being close enough to the truth to be viable, but far enough from it to be false and worthy of a stiff financial (and brand equity) punishment? I still feel the responsibility needs to be at least partly owned by the market, the consumer. Vibram’s very existence owes itself to the fact that a market grew, very quickly as a result of Born to Run and similar stories, to create the demand for barefoot shoes. That demand was fuelled by claims like those above, claims that barefoot running was natural, and better, and there was even some science that tentatively explored the biomechanical predictors of injury and found potentially positive changes. So yes, Vibram overstepped the mark. But they were accompanied there by a hype created by people who, to return to an analogy I’ve used often recently, swung the pendulum all the way from “You must have shoes” to “Shoes cause injury”. That was the original mistake, and that’s the fault of zealous, evangelical advocates, of whom Vibram are only one (a large one, sure). So we’re left then with a realization that the advocacy far outstripped the science. This was predictable. We are also left with many questions to answer about minimalist and barefoot running, and this is not an area that is dead and buried. People must not make the mistake of confusing this settlement with a finding that barefoot or minimalist running actually cause injury. That has not been shown either way. All the settlement says is that Vibram advertised falsely, promising benefits that could not be substantiated. In other words, the evidence doesn’t exist. Yet. When will it? We don’t know. I’m not hugely optimistic that the crystal clear answer that people seek will be forthcoming any time soon. It is too complex, and the individual differences between us make it very difficult to pin down the kind of simplicity that will be needed. Even a longitudinal prospective study (this is where researchers identify a group, and then track them in tremendous detail over a long period of time to document their outcomes in response to some intervention) will not provide a clear answer, because the generation of injury rarely follows the same path. My PhD student, Nic Tam, recently published what we think is a balanced critique of barefoot running, including the biomechanical and training factors that have been linked to injury, and the list is deep. What complicates matters further is that all many of the factors interact with one another, so I there are too many strings to pull to allow even a very good prospective study to control. The result is that a prospective study needs perhaps thousands of people whose training habits are tightly controlled before it even hints at a meaningful answer. To date, then, the research has been focused on those factors known to predict injury, and then to determine how barefoot running influences them. Again, I’d recommend Nic’s review of the literature for the more detailed summary of these. There are instances where this has been done – the most famous paper was published by the Harvard group and showed a large reduction in the impact loading rate in habitually barefoot runners, who landed with a forefoot strike. There are two contentious issues about this finding. The first is that loading rate as a predictor of injury is highly debatable. I recently attended the IOC Medical Conference in Monaco, where Prof Benno Nigg spoke about running shoes and injury, and one of the few points he made very strongly was that he did not believe there was any association between impact forces and injury. At all. Other disagree, and there is evidence that associates high loading rate with certain injuries. The second (more important for strategic thinking) consideration is that Lieberman’s study on loading rate didn’t really pick up a group of runners who clearly go the OTHER way when barefoot. Below is a graph I have redrawn from Lieberman’s paper, showing the loading rate in THREE groups under different conditions. So, while those who land on the forefoot when running without shoes experience a reduction, there is a subset of people who go the wrong way, and not by a small amount either. A 7-fold increase in the very factor that may predict injury should be cause for concern. Your question, of course, will be “How many people are in that group?”. The answer, all told, was about 50%, and that included people who were habitually barefoot in Kenya. Incidentally, we’re currently researching the same questions, and we find that about 50% to 60% of runners will continue to heelstrike when they first run barefoot. This is of course not incorrect, and the study is strong with contextually important findings. However, I would argue that it is incomplete, and given that the debate about barefoot running exists among people who DO run in shoes TODAY, I’d say that this emphasis missed its true calling in terms of how the debate was being had at the time. I wonder: If this had been the finding, would the already booming barefoot business have gained that little bit of extra momentum that has ultimately resulted in a $3.75 million settlement? Not that I’m in any way saying that this study alone prompted false claims. Indeed, Vibram did not even claim an impact benefit in their punished advertising. But it does show you that looked at from a different perspective, the same set of findings can mean a different thing, and we do, to some extent, shape ‘reality’ by choosing one perspective at the expense of another. And people, judging from the Vibram lawsuit, can lack the nous to tell two extremes apart (a cautionary tale for why polarized simplicity is not always wise). Can the “skill” of barefoot running be acquired? Is it even a skill? Are there some people who cannot and will never make these supposedly favorable adaptations? What that previous study and others have given us is a set of biomechanical factors that for now, indicate the extent to which a runner is able to shift running technique and biomechanics when barefoot. 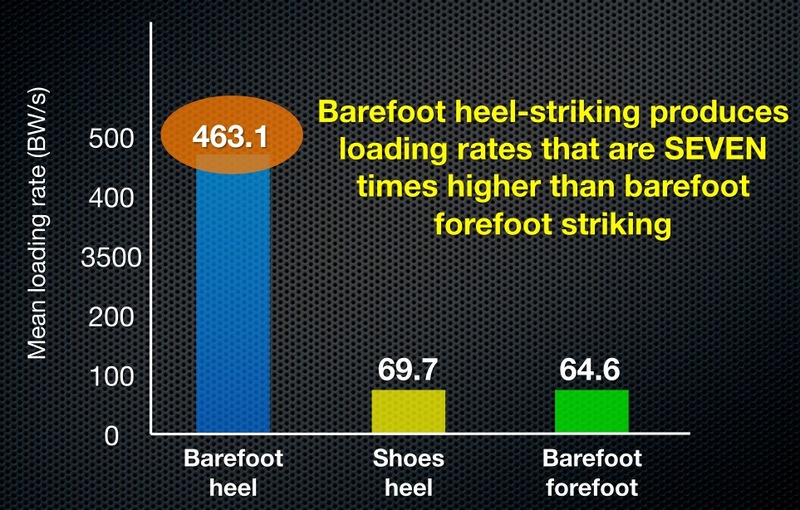 There’s debate as to whether these adjustments are favorable or not (some say impact force and rate are crucial, others disput it, for instance), but nevertheless, we see changes when barefoot in some runners.In others, we don’t – I told you of our research showing that about 60% of runners don’t make any measurable adjustments without their shoes. The question is whether they will remain this way, whether they will nature acquire and adapt so that 8-weeks or 12-weeks they do, or whether they need specific instruction in order to access those adaptations? These are not obvious answers, because nobody really knows. Nic has just finished a longitudinal training study in this regard, and is currently visiting collaborators in Canada to work on analysis of the data. I think these are important questions to answer because if (or rather when) those long-term, prospective studies are done, it will be impossible to explain the general outcomes (fewer injuries in Group 1 compared to Group 2, for example) without first understanding the various pathways to biomechanical success or failure. I’ve no doubt that many, all around the world, are exploring those long-term studies now, and perhaps in a few years we’ll know much more about how little we know! Until then, barefoot running remains a very viable alternative for a lot of runners. It is without doubt effective at changing loading and muscle activation patterns, and is enjoyable to a good many people, whose running is much more successful as a result of discarding the shoes. It is therefore a sustainable niche, one that will not die out and be viewed by history as a “fad”, but I don’t think it will become the revolution in running either. It has also had a significant effect on the shoe industry, with most brands recognizing the need to move away from their previous extreme, but hopefully not to a new one. And hopefully, a bit of balance will silence the zealous voices from either direction.